His text Database Processing was first published in 1977 and is now in its 14th edition. He has authored and coauthored many other textbooks, including Database Concepts, 7th ed. (2015), Experiencing MIS, 7th ed. 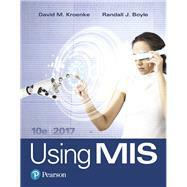 (2017), SharePoint for Students (2012), Office 365 in Business (2012), and Processes, Systems, and Information: An Introduction to MIS, 2nd ed. (2015). Randall J . Boyle received his Ph.D. in Management Information Systems from Florida State University in 2003. He also has a master’s degree in Public Administration and a B.S. in Finance. He has received university teaching awards at Longwood University, the University of Utah, and the University of Alabama in Huntsville. He has taught a wide variety of classes, including Introduction to MIS, Cyber Security, Networking & Servers, System Analysis and Design, Telecommunications, Advanced Cyber Security, Decision Support Systems, and Web Servers. His research areas include deception detection in computer-mediated environments, secure information systems, the effects of IT on cognitive biases, the effects of IT on knowledge work- ers, and e-commerce. He has published in several academic journals and has authored several textbooks, including Experiencing MIS, 7th ed., Corporate Computer and Network Security, 4th ed., Applied Information Security, 2nd ed., and Applied Networking Labs, 2nd ed.